Eyes and lips care due to one product – Future Solution LX Eye and Lip Contour Regenerating Cream from Shiseido. Home›Cosmetics›Eyes and lips care due to one product - Future Solution LX Eye and Lip Contour Regenerating Cream from Shiseido. Eyes and lips care due to one product - Future Solution LX Eye and Lip Contour Regenerating Cream from Shiseido. Future Solution LX Eye and Lip Contour Regenerating Cream from Shiseido is destined for all women valuing and cherishing young appearance accompanied by healthy complexion. What is more, this cosmetic is recommended for both eyes and lips skin care. Generally, the product is created for mature skin type that happens to covered with mimic wrinkles and fairly visible dark circles around eyes. How does Future Solution LX Eye and Lip Contour Regenerating Cream from Shiseido work? The prime aim of the cosmetic is dermis cells regeneration. What is more, the product smooths fine lines not only around eyes but also around lips. Moreover, Shiseido cosmetic reduces puffiness and bags under the eyes, counteracts the first signs of skin ageing, improves firmness and the hydration level of dermis. Equally important, Future Solution LX is responsible for strengthening collagen fibres which are known for maintaining face shape in a good condition. To put it another way, the resilience of complexion is improved. Basically, use Future Solution LX Eye and Lip Contour Regenerating Cream twice a day, AM and PM. Note, the cosmetic application should be the final step of every morning and evening skin care process. While talking about application, distribute a pearl-size quantity of the product both on the upper and lower eyelid. This procedure can be performed with the aid of attached spatula. After that, pat the cream with the fingertips. You can mix the application with eye skin area massage as well. In the same fashion this kind of treatment should be performed around lips skin area. When it comes to the composition of the product, Future Solution LX from Shiseido comprises of two specialistic ingredients which maintain firmness of skin, fill fine lines, regenerate skin cells, help in regaining adequate moisture and inhibit skin ageing processes. Additionally, the composition includes also cherry blossom extract of tautening properties, green tea protecting skin from the harmful influence of the solar radiation as well as yeast extract which increases the level of collagen and hyaluronic acid. Another components of Future Solution LX from Shiseido are glycerine, iron oxides, SLS, silica, lanolin, PEG, plant and floral extracts. The package itself is a small jar of dark blue colour decorated with golden ornaments. The jar, in which Future Solution LX is sold, has 15 ml capacity. 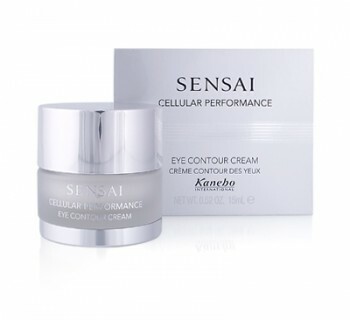 Sensai Cellular Performance Eye Contour Cream. Royal eye skin care with Guerlain - Abeille Royale. © Copyright Women tests. All rights reserved.